Have you received Amazon reviews that read like? Most people read Amazon book reviews before they buy a book; too many negative reviews and a book becomes toxic. No one wants to read a book with hundreds of grammatical mistakes and misspelled words in it. You might be a very good storyteller with an unbelievable imagination, but your work has to be something that readers can read and easily understand. To eliminate much of this problem, you should always use MS Word's spell checker. 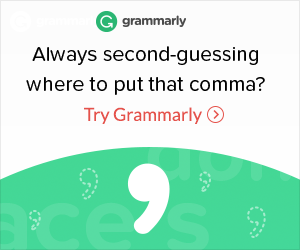 You should also have as part of your writing arsenal the program, “Grammarly,” from Grammarly.com. It works something like your word processor’s spell checker, but it’s much more through. It warns you, as you type, of potential mistakes you are making. It’s like a nagging but loving English teacher hovering over your back watching every word you type and correcting your mistakes before you are even done with the sentence. All of a sudden a word is highlighted and you know that you’ve missed a comma or had added one you didn’t need, or you used a “to” when it should have been a “too.” Those types of mistakes can really take a toll on your reputation as an author. You are supposed to know how to write a sentence if you are claiming to be an author. Regardless of how good you think you are you still need Grammarly that doesn’t get tired as the night wears on. When you are trying to concentrate on how to describe that opening scene, Grammarly is calmly waiting there to make sure your exuberance to deliver a good story doesn’t let you forget the rules of grammar and how to spell and use those words that are so crucial in conveying that story swirling around in your head. I used it all the time and felt much more comfortable knowing that the majority of my mistakes are corrected. You need to check their program out if you don’t already use it.